Michael Starkey read a Vice News article. Then he decided he wants to go to war. That was a month ago. 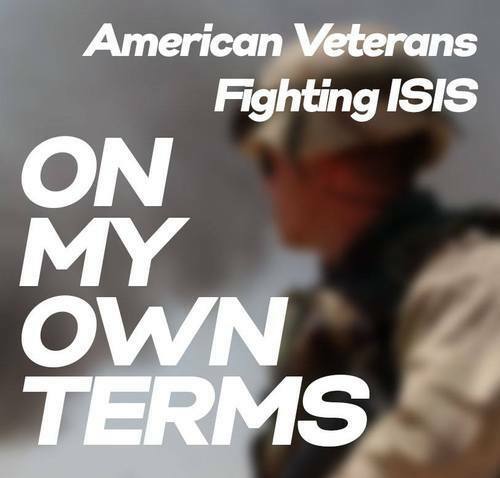 Today he’s pushing a crowdfunding campaign to pay for his documentary “On My Own Terms” about American veterans who decided to join Kurdish YPK forces fighting ISIS in Syria and Iraq. General international press standards say reporters should remain unarmed to avoid all journalists being seen as a target or less than neutral. Well Starkey’s not having it. “I’m going to stick up for myself,” he said. Part of the $80,000 he wants will go toward equipment like 4K cameras, drones, Kevlar body armor, some walking around money and night vision goggles (for vets on the ground in Syria who said they need the gear, Starkey said). To attract media outlets to invest in his crowdfunding campaign, those who give $250 get unlimited access to video and images he takes for the documentary that can be used for B-roll, newsreel or other purposes. Starkey plans to follow vets associated with a YPG-tied Facebook page that invites westerners to join the fight called Lions of Rojava. The Facebook page has been written about by Business Insider, UPI and RadioFree Europe. Their poster boy Jordan Matson was recently interviewed by USA Today. This interview was conducted via Skype and has been edited for brevity and clarity. Johnson: I know that in instances of reporters embedded with a military force in Iraq or something or even journalists who have entered ISIS areas to report things, in both instances, if they’re embedded, they will have their work censored by that party. Are you concerned about that? Starkey: Yeah that’s one thing. I would have to work with the Kurdish, making sure that what I have they would be OK with me releasing but from my experience in public affairs with the US military it shouldn’t be an issue because they’re out going against ISIS. Now if I was working with ISIS that might be a different story but I have no intention of trying to reach out to ISIS cause a lot of journalists right now are scared to even go over to the region because of the issues ISIS has been targeting them. Johnson: Well there’s James Foley of course. Johnson: Would you consider fighting there? Starkey: I think I’m going to have to do that. I’m prepared to operate like a Combat Camera does in the military. Combat Camera is made up of Navy, Air Force, Army and Marine Corps, and you pretty much document while everyone is fighting. You record videos, you take photos and stuff. But you’re armed because you have to be prepared to fight as well. So that’s kind of the secondary mission. I’m going over there to document what’s going on but I will be prepared to fight because I’m going to stick up for myself. Johnson: So you will be armed? Johnson: Do you think that puts you in a different class than say a James Foley or someone else that was over there? I don’t know if they were armed or not but sort of the international press they usually don’t carry a firearm. Starkey: Yeah and that’s one thing too with me operating independently I get to, to use my project’s name, I get to be on my own terms because I’m not hired by the AP or National Geographic or something. Those guys when they go over there, I’ve worked with a lot of journalists in Afghanistan, they’re not armed. They rely on the forces that they’re fighting with but I’m coming more from my background where you actually are prepared to fight while documenting the situation. Johnson: In the video that’s on your Kickstarter page you mentioned that a portion of the money will go toward some equipment there? Starkey: Yeah they’ve been asking for night vision so that’s something I would want to get which would benefit me for shooting a documentary too. They [Kurdish YPK forces] just don’t have equipment that like that. Of course I wouldn’t be able to buy high-end military equipment with this money but technology is good enough now that you can get some decent stuff used that would be better than nothing. Johnson: Your motivation is essentially that you’re not tied down by anything in particular and you want to tell this story. Starkey: I do think it’s a story that needs to be told. Why in the world would someone who has a nice, safe life in the US go and fight for foreign forces against the worst terrorist group of the moment? And they’ve said things, this is their words not mine, but a lot of veterans feel that the situation in Iraq has deteriorated and they’re kind of doing it for all the fallen soldiers in Iraq to make sure their efforts weren’t for nothing over there. I’m not trying to be political and say that the Iraq war was good or bad. I just I want to tell their side of the story and I feel that a lot of times the camera is more powerful than the gun so going over there and getting that first-hand footage of really what’s going on and having that uncensored media available to people… That’s something I personally feel I can do to contribute to ease the situation.